The Arvada Center’s upcoming production of “Les Miserables” features an almost entirely local, 29-person cast, save for the name at the top of the list, and it’s a big one: Randal Keith, who won a 2006 Denver Post Ovation Award for his performance as Jean Valjean in the national touring production of “Les Mis,” will reprise the role in Arvada opening Sept. 16. Jeffrey Kahane, music director and piano, leads the CSO in a rare treat of a performance â€¦ an all Mozart evening at the Arvada Center. As the regionâ€™s only full-time professional orchestra, the CSO embraces a tradition of musical excellence and enriches the souls of music lovers of all ages. This memorable concert includes Overture from the Abduction from the Seraglio, K. 384, Piano Concerto No. 20, K. 466 and Symphony No. 39 in E flat major, K. 543. 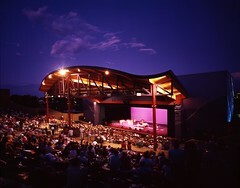 An evening of great classical music under the moonlight is an event you wonâ€™t want to miss. The Song Remains the Same – The Music of Led Zeppelin, a Jeans â€˜n Classics Symphonic Concert with Orchestra and Rock Band. This symphonic rock concert combines a classic rock band and headliner vocal with a symphony orchestra making Jeans â€˜n Classics concerts the hottest and fastest growing phenomenon on the concert scene. You are in for a rockinâ€™ evening with a classical twist of Led Zeppelin tunes including Dazed and Confused, All of My Life and Stairway to Heaven.